This document was issued in New Bedford to the schooner Union, which was under the command of William H. Reynard, Jr., with a carrying capacity of only 66 22/95 tons (known as “burden”). The vessel was heading from New Bedford bound for the Atlantic Ocean, with provisions and stores with utensils for a whaling voyage. Captain William Hathaway Reynard, Jr. was the son of a sea captain and spent his life as a mariner. He first went to sea on a whaler out of New Bedford at the age of fifteen and worked his way to mate and then master. This voyage in the small schooner Union was made in the waning days of whaling and near the end of Capt. Reynard’s career, which ended with his retirement in 1885 at the age of 41. He then married and led a prosperous life ashore. The schooner Union made at least five relatively short trips, each lasting about a year, before this voyage. Even though she was small, she carried over 20 men in her crew and often sent back barrels of oil on other ships since her own carrying capacity was small. This sea letter is in four languages: French; Spanish; English; and Dutch and was signed by President Rutherford B. Hayes who had announced he would serve only one term from March 4, 1877 until March 4, 1881. Hayes was in the early months of his administration when he signed this sea letter. His election was by the smallest of margins after loosing the popular vote and winning in the Electoral College by a single vote. Throughout his term, he worked to bring about civil reform, end Reconstruction in the South, protect the former slaves and reconcile the residual stresses from the Civil War. 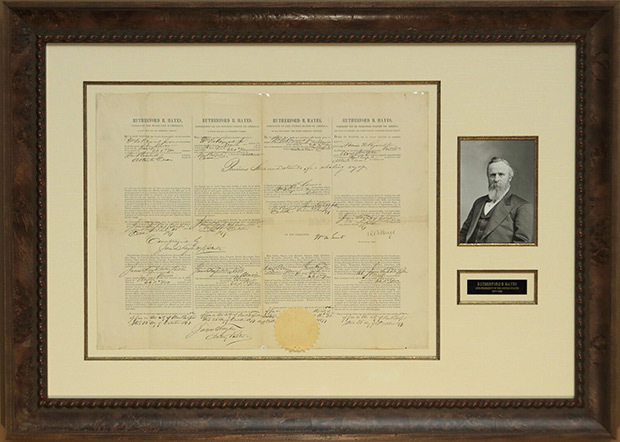 The document was also signed by Secretary of State William Maxwell Evarts, who, as one of the top lawyers in the country, was retained by President Andrew Johnson as his counsel during his impeachment trial. Afterwards, Johnson appointed Evarts as Attorney General. As Secretary of State, he wrestled with the issue of recognition of the Mexican government of Porfirio Dias and also the West coast anti-immigration supporters who wanted to stop the arrival of Chinese immigrants despite the 1868 Burlingame-Seward Treaty. This treaty, negotiated by his predecessor, seemed to guarantee Chinese immigration to the United States and had to be clarified in 1880 with the Angell Treaty, which allowed the U.S. to suspend but not prohibit the immigration of Chinese laborers to the United States. James Taylor also signed as both Collector of Customs and Notary despite the fact that the actual Collector of Customs for New Bedford at this time was John A. P. Allen. This sea letter was printed on rag paper and bears the Great Seal of the United States in the center bottom extending off the document. It also has the embossed seal of the District of New Bedford Collector of Customs in the center right and the notary seal over his name.